Super Birki's are also suitable for vegans. 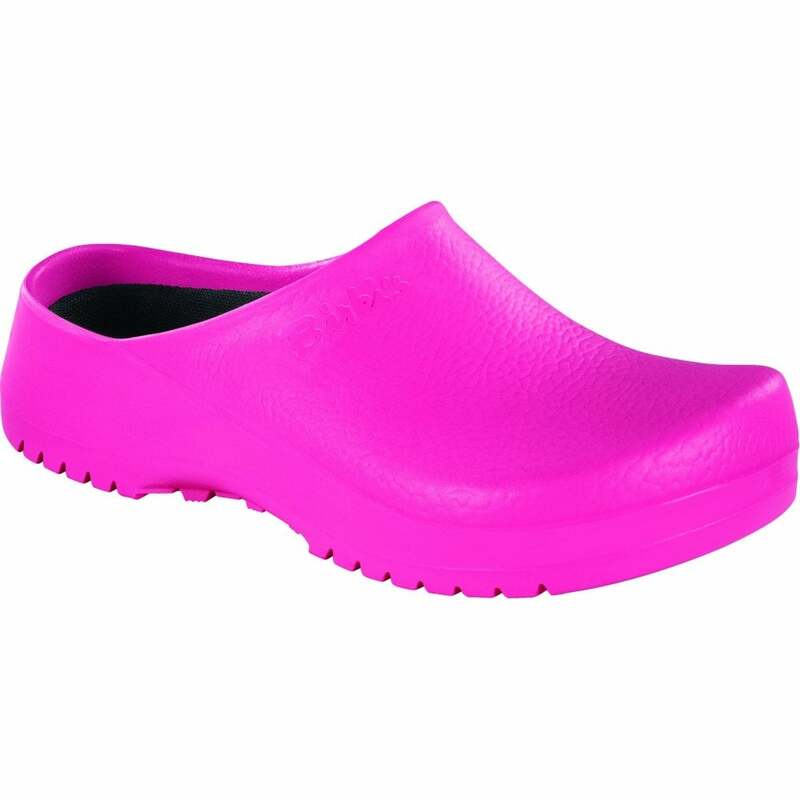 All Birki clogs are made of durable and waterproof polyurethane (PU). This is a very versatile material and has some unique features. The materials low density makes the clogs lightweight but provides high abrasion results. The PU contains innumerable tiny bubbles, which acts as shock absorbers. Polyurethane is produced using environmentally friendly processes, without using the solvents OFC and FC. PU in a non-absorbent material, thus preventing a build-up of bacteria. It also protects against acids and alkaline, making the clogs suitable for laboratory or kitchen work. The microfibre used by Birkenstock® is a high quality material with a nubuck-like look. Microfibre is extremely durable and lightweight; it is easy to clean and retains its colour. It is a very breathable material, which ensures a skin-friendly environment for the foot. Microfibre is used both for uppers and as a footbed liner. Your clogs should feel roomy. The extra room is needed to perform the natural rolling motion of the foot without restrictions - just as if you were barefoot. This is made of very durable and very waterproof material. This versatile Birkenstock shoe has some unique features. The materials low density making it lightweight but provides high abrasion results. It contains innumerable tiny bubbles, which acts as shock absorbers. The materials are produced using environmentally friendly processes, without using the solvents OFC and FC. It is a non-absorbent material, thus preventing a build-up of bacteria. It also protects against acids and alkaline, making the clogs suitable for laboratory or kitchen work. If you're on your feet all day you're sure to be interested in our many crocs styles.